Place the flour and salt into a large bowl and stir. Make a well in the centre of the flour. Add the water and stir to combine. As the dough begins to form, use your hands to bring it together. Turn the dough out onto a floured bench. 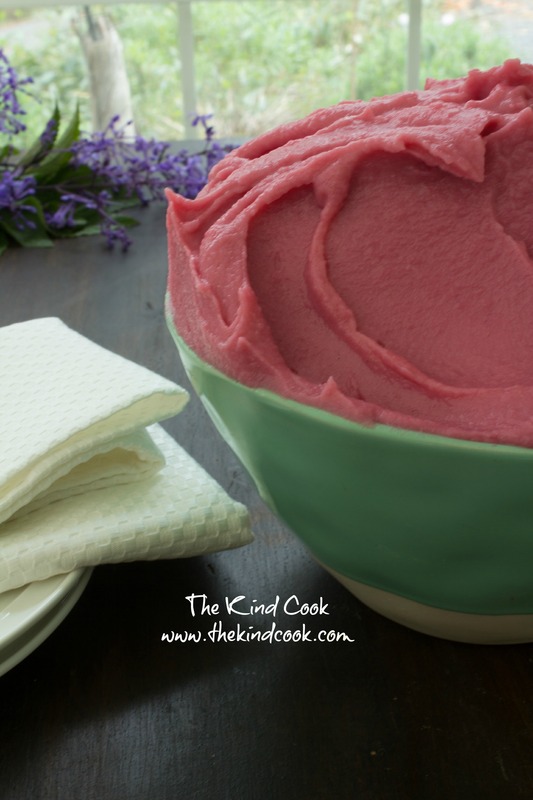 Knead it for a few minutes until it is soft and smooth. Portion and weigh the dough into 8 balls. Cover the balls with a clean tea towel. Lightly flour a rolling pin and roll one of the balls into a 20 cm circle. Brush it with a little coconut oil. Roll the circle into a log, enclosing the coconut oil. Then roll the log lengthwise into a coil shape. Once it’s in a coil shape, using the rolling pin, flatten the coil back into a 20cm circle. Repeat with the remaining balls. Lightly brush a heavy based pan with a little rice bran oil. 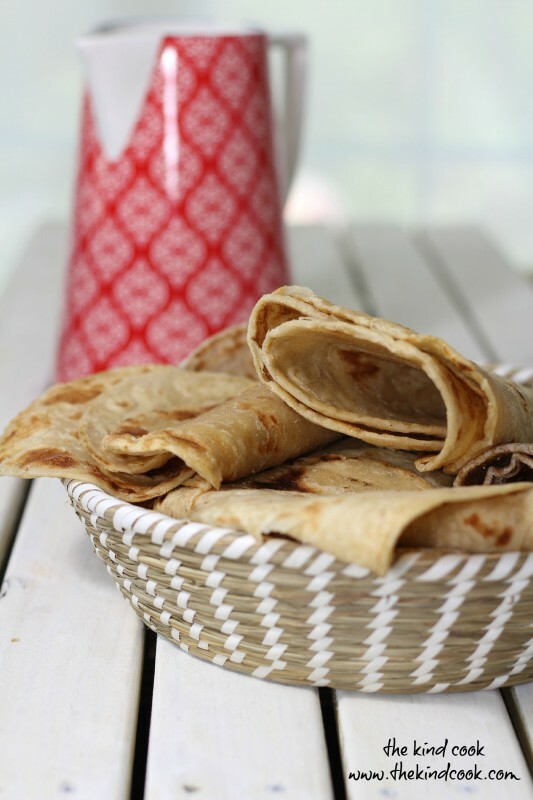 Place one of the uncooked roti on the pan and cook it on a medium heat. Wait until it starts to puff up. You will hear it “whistling”. Once it has started to brown, flip it over and cook the other side. Repeat with the remaining roti. Serve them freshly cooked and still warm. Time: 15 minutes preparation. 15-20 minutes cooking time. Notes: Atta flour can be purchased in supermarkets and Indian grocers. It is much finer than normal wholemeal flour and results in a much lighter pastry like bread than if you use regular wholemeal flour. 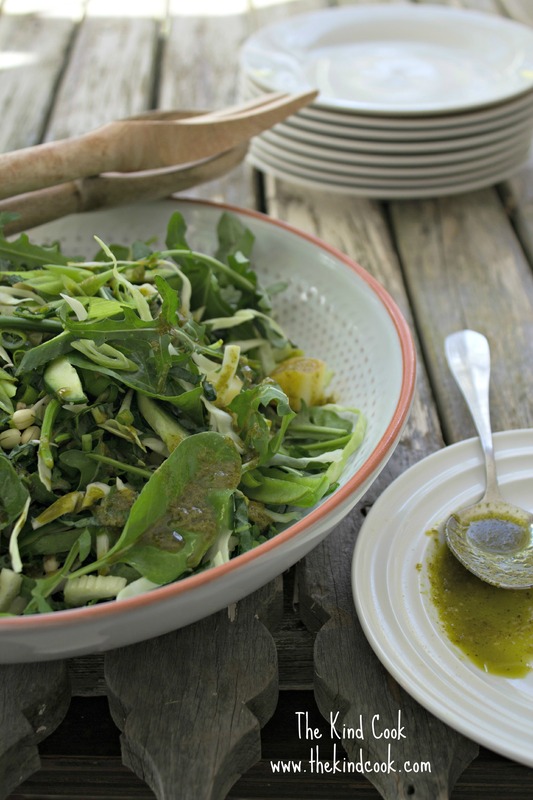 Packed with nutrition, texture and flavour, mostly raw and dressed with such a simple olive oil and herb dressing, I just love this super green salad. Combine all ingredients into a large bowl and mix well. Place into a serving dish. Blend all ingredients till smooth. Drizzle over the salad and serve. Yields: We enjoy this as a huge main meal salad for 2. 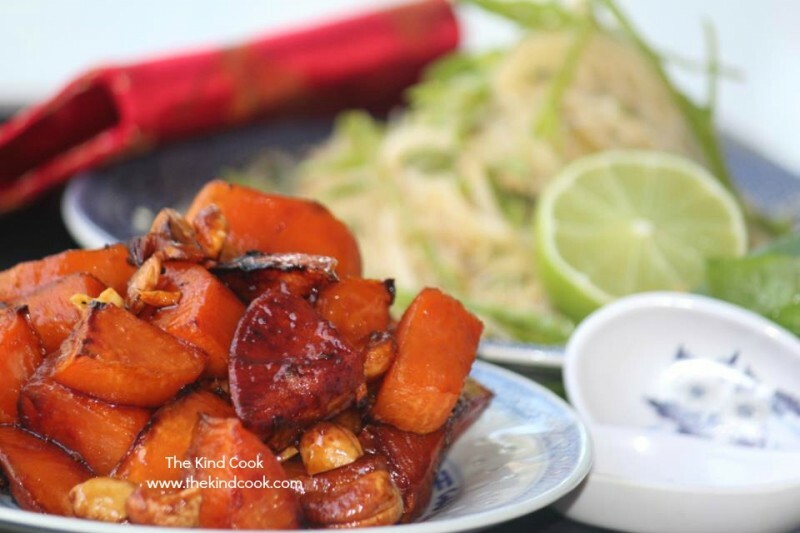 Alternatively it is a polite side dish for 4-6. Time: 20 mins to prepare all the salad ingredients. 5 – 10 minutes to make the dressing. Notes: If you eat tofu it’s a nice addition or can be used instead of the potato. The dressing yields enough for 2-3 salads. I make it up in bigger batches and use it in any other salads, drizzle it into mash potato or use it as a dipping sauce. Do not dress the salad until just before it is to be served. Bring a medium pot of water to the boil. Peel the potatoes, cut them into small chunks and add them to the boiled water. Bring the water back to the boil, reduce it to a simmer and cook the potato until its tender. While the potato is cooking, blend the cooked baby beetroots with the 2 tablespoons of oat milk until everything is well combined and smooth. Drain the cooked potato and mash it well. Stir the beetroot mixture through. Add extra Bonsoy if you want the mash to be more creamy. Add the salt, pepper to taste. Check the seasoning and serve. Yields: A generous side serve for 4-6 people. Time: 10-15 minutes of preparation. 15-20 minutes of cooking time. Remove the husks from the corn. Discard the husks and place the corn on the BBQ or an open flame on your stove top. Using tongs, carefully turn the cobs as the kernels blacken. Continue cooking until the corn is mostly blackened. Place the corn, oil, cayenne and paprika together in a large pan. Move the cobs around in the pan so that they are well covered in the seasoned mixture. Pour the beer into the pan with the cobs. Heat everything through and season with salt and pepper to taste. Once the corn is cooked and well covered, turn off the heat. 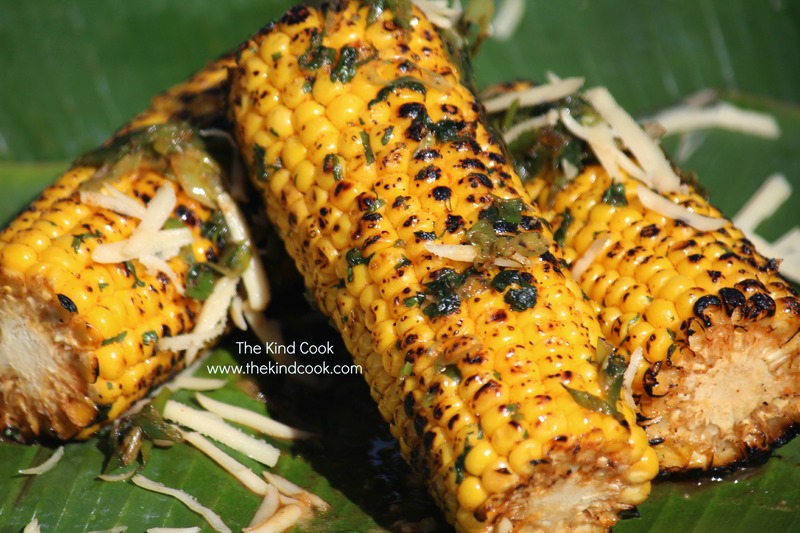 Garnish the corn with the coriander and the vegan cheese (if you are using it) and serve immediately. Notes: If you do not have a BBQ and are not comfortable blackening the corn on an open flame, or if you have an electric stove top, you can blacken them in a dry pan on a high heat instead. This will just take a little longer. 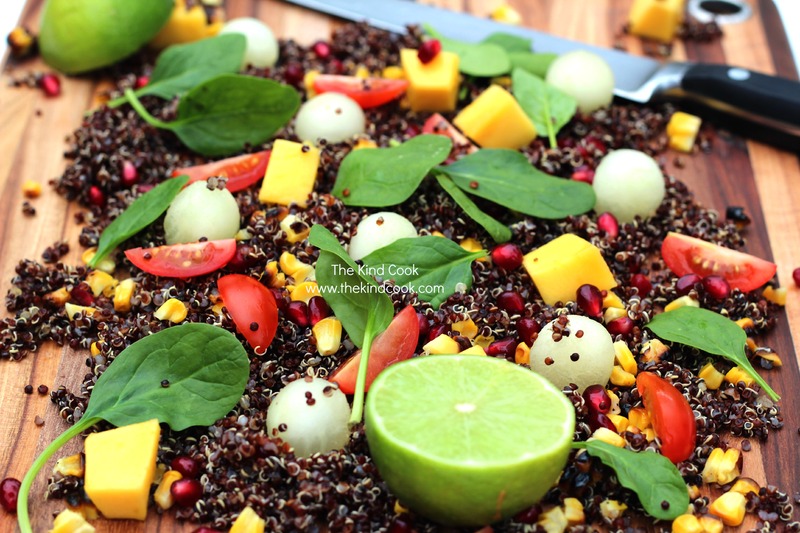 I have not been exploring the world of quinoa as much as I would have liked to yet but when creating some new Christmas inspired recipes for a magazine last month I added what to me are the flavours of summer Christmas. Don’t get too hung up on measurements with this. The intended result is simply nourishment, colour and a medley of fresh gorgeous ingredients. This would go beautifully with bean burgers and a crisp garden salad or it would be the perfect accompaniment to a fragrant nut roast or lovely just on its own for lunch. Rinse the quinoa well under cold water. Drain it and discard the rinsing water. Then place the quinoa into a medium pot with 2 cups of water. Bring it to the boil, then turn the heat down to a gentle simmer and cover the pot. Cook for 15 minutes or until the liquid is absorbed. When it’s cooked, it resembles little curls. Once it is cooked, allow it to cool and set aside. While the quinoa is cooking, remove the husks from the corn and place the corn cobs on an open flame. Turn the cobs as the kernels start to blacken and continue cooking until all the corn is cooked. Once it has cooled, slice the kernels from the cob. Discard the cobs and set the kernels aside. Cut the cherry tomatoes, lengthways into 4 and set aside. Remove the stone from the mango, cut the cheeks of the mango off and slice and remove cubes of mango. Discard the stone and peel and set the mango cubes aside. Remove and discard the seeds and skin from the melon and either ball the melon with a melon baller or cut it into cubes. Mix all the ingredients together now, except for the lime and olive oil. When you go to serve the salad, squeeze lime juice over the it and drizzle some olive oil over the top also and serve. Notes: It’s really important to rinse the quinoa well because depending on how it has been produced it can have a very bitter flavour. If you don’t have a gas stove top, simply blacken the corn in a pan or on the BBQ. If you can’t find Christmas Melon, you can substitute it for honeydew melon.You can often get pomegranate seeds at the supermarket in the fruit and vegetable section. Otherwise just remove the seeds from a fresh pomegranate. 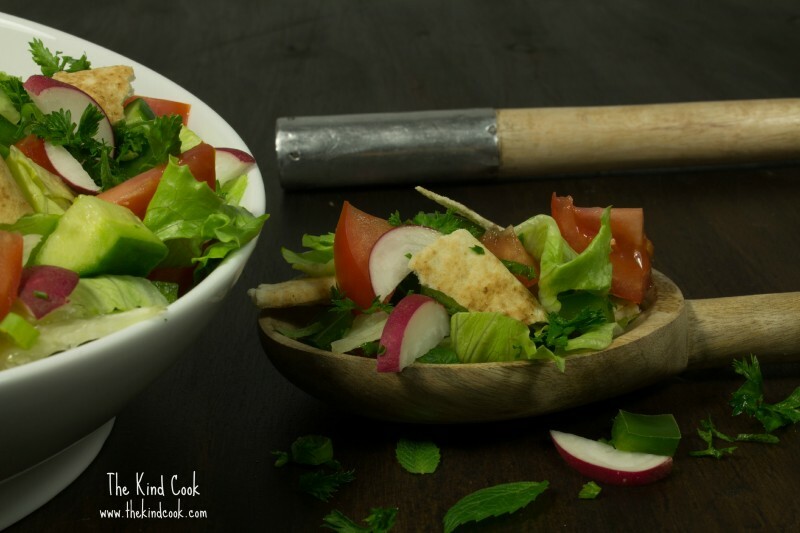 This is a perfect salad for really hot days with your favourite iced cold beer or home made lemonade! 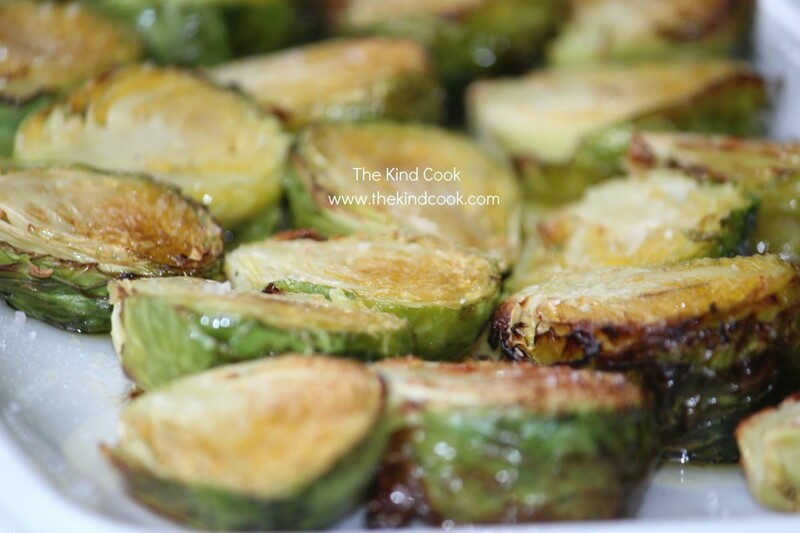 Serve it as a side with homemade pizza or take as an offering to a BBQ. Just assemble it right before serving so that it is still super crunchy. Place all the salad ingredients into a large bowl. Whisk all the dressing ingredients together and add to the bowl with the salad. Mix everything well to combine and serve immediately. Yields: A side dish for 4. Notes: You can purchase vegetarian fish sauce from vegan grocery stores, online and from some Asian grocers. Otherwise simply replace it with 2 tablespoons of organic tamari or soy. 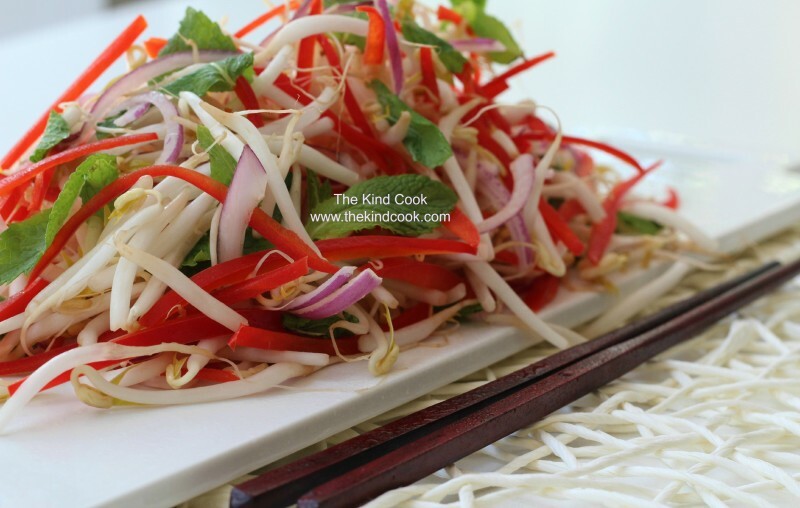 This is also delicious with the addition of handful of Thai basil and/or thin strips of fresh coconut meat.